The ALUPILOT 14 M was designed in mid 1990s for the Danish Pilot Authorities as an amalgamation of previous 15 and 13 meter projects. It has been adopted as a standard design and as of late 2003, 11 boats are in service with two more under construction. 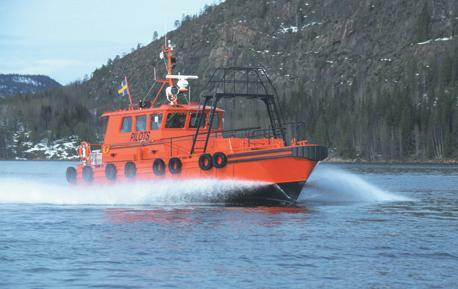 The ALUPILOT 14 M is a semi-displacement all aluminum craft with a resiliently mounted GRP sandwich deckhouse. The hull design is based on the well-known Murray Cormack lines modified for higher speeds. The arrangement is laid out with a raised wheelhouse with round the horizon visibility and a semi-sunk saloon seating up to 8 pilots. An alternative lay out with a one-tier wheelhouse / saloon is also available. Two diesel engines of heavy duty rating at 330 kW / 1800 rpm, each connected to a fixed pitch propeller through a gearbox with reduction 1.5:1 give a service speed of 22 knots. The sheer strake is heavily reinforced and carries a truck tire fender system to cope with boarding of coastal vessels with protruding fender strakes often seen in Baltic traffic. To cope with Nordic winter conditions the boat is fitted with heating not only for the interior but also for the front windows, decks, railings and the boarding rig. Classification is according to the Special Service Craft Rules of Lloyd’s Register.